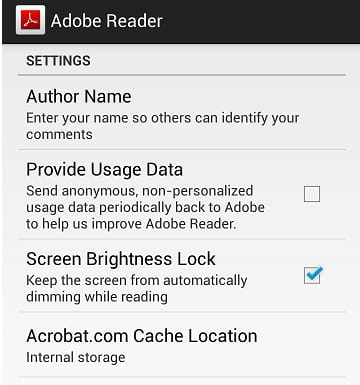 Here's how to change the location of Adobe Reader's cache on your Android smartphone. Open the Adobe Reader app. Tap on the menu key (3 vertical dots) > Settings. Tap on Acrobat.com Cache location. Published by jak58. Latest update on December 31, 2014 at 07:59 AM by jak58. 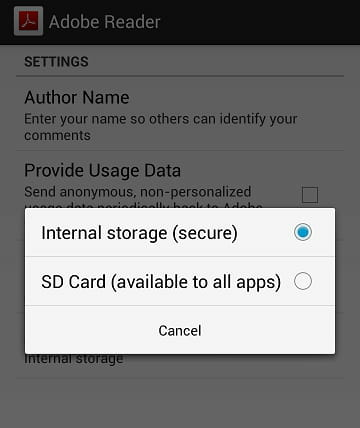 This document, titled "Adobe Reader for Android - Change the location of the cache," is available under the Creative Commons license. Any copy, reuse, or modification of the content should be sufficiently credited to CCM (https://ccm.net/).